Purpose of test is to determine if the font weight is being correctly rendered. A number of font families are specified. The numerical weight values (100 to 900) should show the lighter weights on the lower numbers and the heavier weights on the larger numbers. Heavier is defined to mean 'no lighter'. If only one font weight is available, they should all display at the same weight. 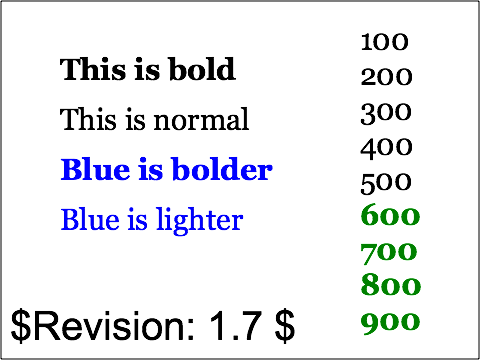 The transition from black to green figures shows the correct light to bold transition for the common case where two weights are available. 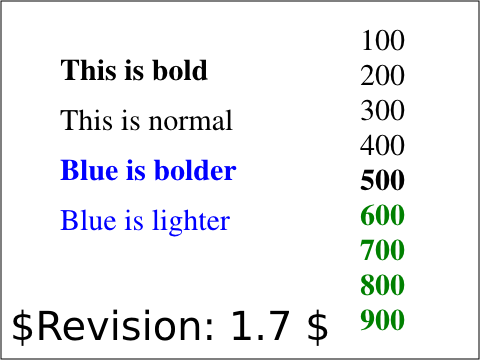 If three or more weights are available, see the CSS2 specification for how these are allocated to the nine weight numbers. The absolute keywords 'normal' and bold' are tested by the first two lines on the right hand side of the test, the third line of text tests the to 'bolder' relative keyword and the fourth tests the 'lighter' relative keyword.